Red Bank municipal offices are located at 90 Monmouth Street, Red Bank NJ 07701; phone: 732-530-2750. 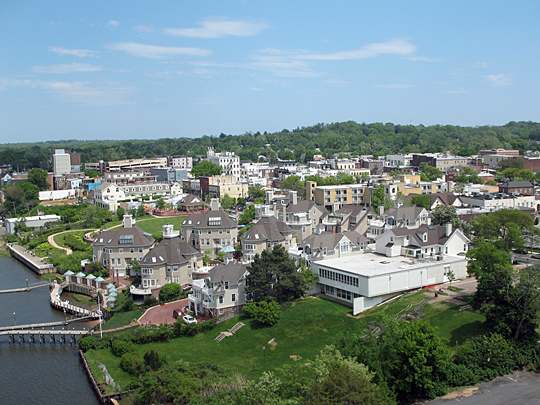 Photo: Red Bank Aerial View, user:JTFeldmus, photographer, May 2007, en.wikipedia.org, accessed August, 2012. Location: New Jersey Coastal Heritage Trail, State Route 35 at Navesink River, Red Bank, Monmouth County, New Jersey. Significance: The town of Red Bank is significant as a mid nineteenth-century manufacturing and trade center for southern New Jersey. History: Located inland from the Bayshore towns, along the Navesink: or North Shrewsbury River, the town of Red Bank: thrived on the profits of ships bound for New York. Though obscured by both dilapidation and renovation, downtown Red Bank suggests a more secure commercial past. Consisting of only one store and one hotel in 1829, by the 1860s Red Bank was a substantial market city. Barber and Howe's 1865 history attributed this economic growth to New York business. "Thirteen sloops and schooners sail from here with vegetables, wood and oysters for that market; and a steamboat plies between here and the city. Vessels, week after week, have taken oysters to New York, and returned with $600 or $700 for their cargoes." As historians commented on Red Bank shipping, new trade routes were supplementing river transportation and increasing demand for local products. The Raritan Delaware Bay Railroad, operating in 1860, was joined by the New York and Long Branch Railroad lines, which began sending Pennsylvania and Jersey Central trains to New York five years later. Writing shortly after the town was chartered in 1870, Woolman and Rose noted Red Bank's rapid growth, "considerable" trade with New York, and the presence of a canning factory. By 1889, the "modern town" was considered a manufacturing center for northern Monmouth County and included an iron foundry and brush and carriage factories. During the late nineteenth century, when Red Bank served the popular summer resort of Long Branch, the commercial city also developed resort attractions of its own. Kobbe noted the proximity of Newman Iron and Sulphur Springs and the Newman Springs Hotel, just a short drive south of the train station. The Navesink provided opportunities for water sports as well as a picturesque view, both enjoyed by members of the Red Bank Yacht Club. The town became well known as an ice-boating center for New Yorkers. Fifty years later, the river had "ceased to be a transportation factor in the Borough's growth" and instead had "become the annual scene of the National Sweepstakes Regatta." Often mentioned in conjunction with the town of Red Bank, the North American Phalanx was established about five miles west of the settlement in 1843. A group of ten progressive families combined funds to purchase the old Van Mater farm, 673 acres of farmland, woods, meadow and marl. Though the commune, inspired by the ideas of Fourier and the example at Brook Farm, did not flourish immediately, by 1852 the settlers had developed "one of the most productive and profitable" farms in the state. The success of the socialistic venture carried over into nearby Red Bank, and even on to New York; eventually the Phalanx purchased stock in one steamboat traveling between the two cities and another making trips from Keyport to New York. "The first packaged and trademarked cereals ever sold in this country came from the Phalanx mills." Despite continued success over the next ten years, individual ambition and religious disagreements, combined with a costly fire, resulted in the closing of the Phalanx. The land was divided and sold in 1855. Though Red Bank's rise as an enterprising industrial center suggests a colorful history, historians have seemed reluctant to comment on either its social or residential development. Named after the red banks of the river supplying its economic livelihood, the town was characterized as "brisk" and "up-to-date" in the 1930s, an image that must have suggested a lack of history to twentieth-century commentators. The WPA guide does mention the largest factory, the Sigmund Eisner Clothing Plant, producer of Boy Scout and military uniforms. Almost half of the guide's town history is devoted to the novel local industry of gold beating, which dates back to the 1870s. Despite contemporary change, a number of Red Bank's municipal buildings are extant to suggest a stable economic base firmly established by the late nineteenth century. In 1871, the Mechanic Street School's stately, Italianate design articulated by brick pilasters, added an aura of permanence to the neighborhood. Its contemporary, the Red Bank passenger station, welcomed New York and Long Branch passengers with jaunty Stick style patterns of brackets and gingerbread. The Navesink Hook and Ladder Company No. 1, completed ten years later, also manifested the town's commitment to civic maintenance. Representing more than twenty years of fashionable growth since the construction of the school, Shrewsbury Town Hall was at the "cutting edge" of architectural style in 1892. The municipal building is a red brick Richardsonian Romanesque structure with tower and round-arch openings. Today, Red Bank seems less concerned with its stylistic image than it must have been 100 years ago; a diner converted into a Chinese restaurant, a Greek Revival hotel built in 1928, and a F. W. Woolworth's with traditional shiny gold letters are appropriate in a commercial center that has chosen to advance with the times. The dilapidation and neglect which accompanied such growth is perhaps unavoidable. John W. Barber and Henry Howe, Historical Collections of New Jersey: Past and Present (New Haven: By the Author. 1868), 361. H. C. Woolman and T. F. Rose, Historical and Biographical Atlas of the New Jersey Coast (Philadelphia: Woolman and Rose, 1878; reprint, Toms River, NJ: Ocean County Historical Society, 1985). 32. Gustav Kobbe. The New Jersey Coast and Pines (Short Hills: By the author, 1889; reprint, Baltimore: Gateway Press. 1971), 76. Federal Writers' Project of the Works Progress Administration, New Jersey: A Guide to its Present and Past (New York: Public Library of Newark and New Jersey Guild Associates, Viking Press, 1939), 593. "The Township of Ocean" (1949). 84. Federal Works Progress Administration, Stories of New Jersey (New York: M. Barrows and Co., 1938), 180-183. Federal Writers' Project. New Jersey: A Guide, 593. Barber, John, and Henry Howe. Historical Collections of the State of New Jersey. New York: S. Tuttle, 1846. Federal Writers' Project of the Works Progress Administration. New Jersey: A Guide to its Present and Past. New York: Public Library of Newark and New Jersey Guild Associates, Viking Press, 1939. __________. Stories of New Jersey. New York: M. Barrows and Co., 1938. Kobbe, Gustav. The New Jersey Coast and Pines. Short Hills: By the author, 1889; reprint, Baltimore: Gateway Press, 1977. Hunton, Gail, and James McCabe. Monmouth County Historic Sites Inventory Summary Report. Freehold, N.J.: Office of New Jersey Heritage, Monmouth County Park System, and Monmouth County Historical Association, 1981; reprint, 1991. Sebold, Kimberly, and Sara Amy Leach. Historic Themes and Resources within the New Jersey Coastal Heritage Trail: Southern New Jersey and the Delaware Bay. Washington, D. C.: U.S. Department of the Interior. Woolman, H. C. and T. F. Rose. Historical and Biographical Atlas of the New Jersey Coast. Philadelphia: Woolman and Rose, 1878; reprint, Toms River, N. J.: Ocean County Historical Society, 1985. † Holden, Alfred, HABS Historian, Town of Red Bank, State Route 35 at Navesink River, Red Bank, Monmouth County, NJ, Historic American Buildings Survey (Library of Congress), [HABS: NJ-1002] 1991, Washington, D.C.; memory.loc.gov, accessed August 2008.